As an avocado lover, I could not be prouder of this, my best guacamole recipe. It has a delicate balance of flavors that make the creamy taste of the avocado even better. 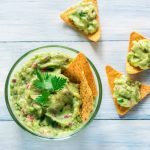 Taco Tuesday would not be the same without this recipe nor would my burgers be complete without a generous helping of guacamole, adding a rich fresh taste to the dish. It works as a snack, a side or a dip but I just eat it by the spoonful all by itself! This guacamole can be used as a creamy dip for chips, as a spread on toast to added to a pizza. Its rich and creamy taste compliments spicy, hot food very well. Cut the avocados in half and remove the pit, peel and dice them. Add one of the diced avocados into a bowl and mash with a fork until it reaches a smooth consistency. Remove the seeds from both tomatoes and dice them. Finely chop the fresh coriander leaves. Now add in the tomato dices, the lime juice, the coriander, the black pepper and the salt, and stir to mix it all together. The chillies and the spring onion can be added here. Lastly, mix in the second avocado gently. Leave some of this avocado in large pieces while mixing to give the guacamole a great texture.